What is a trailblazer? A trailblazer is a pioneer; one that blazes a trail to guide others. Usually the trailblazer is the first one to accomplish something. Sometimes, these accomplishments are considered great, groundbreaking achievements. Make no mistake about it, the movie Black Panther is a trailblazer. It is the first movie of its kind: a movie from a major franchise (Marvel) with a black superhero as the lead character. It’s release is during Black History Month, which adds to the lore of this film. Why is this important? For some, it isn’t important. For me, it is important. This is because all of the super heroes we all know and love are white characters. DC comics characters Superman, Batman, and Wonder Woman (Wonder Woman is the obvious parallel to Black Panther as a female lead character), and many others are all white. Marvel comics has Spider Man, Iron Man, Thor and many others as lead characters who are white. Black Panther breaks this mold. He is the first of his kind: a black lead superhero. NOTE: I must pay homage to other black superheroes such as Blade (played by Wesley Snipes) and Catwoman (played by Halle Berry). They are also important characters in the own way. However, those characters are more singular, unlike Black Panther, who is a part of the much larger and more popular Marvel franchise. In order to fully understand, we must talk about black “firsts” to put the importance of this film into perspective. What is a black “first”? It is the first time someone black accomplishes something significant in history. It is usually a monumental achievement, due to the fact that many of these trailblazers face significant challenges on their way to success. (By the way, let me be the first to “apologize” to anyone who is tired of hearing about black “firsts”. Unfortunately, our inclusion into many American institutions occurred so late that we still have black “firsts” in 2018. You will continue to hear about black “firsts” for a long time to come). Although it is not on the same level, this movie is the latest of black “firsts” that changed the world we live in. It is groundbreaking like Barack Obama’s ascendancy to become President of the United States. It is like Jackie Robinson breaking the color barrier of Major League Baseball. It is similar to Ruby Bridges integrating an elementary school in New Orleans. Each of these black “firsts” opened doors for so many black people, as well as other minorities, people with disabilities, and LGBT as well. People like Barack Obama, Jackie Robinson, and Ruby Bridges are trailblazers: the first of their kind. The movie Black Panther qualifies as a trailblazer as well. Black Panther contains imagery, costumes, and scenery that will impress and delight moviegoers. It depicts a fictional country, Wakanda, and all of its majesty and splendor. It is patterned after the imagery of many areas of the continent of Africa. I guess you could call it a futuristic look the continent that also has images of Africa’s past and present look. This is very important and groundbreaking. It gives positive images of a black civilization and what it should look like under the right direction and guidance. On another level, it shows what some black communities in the United States used to “look” like before urban blight and decay took over. The move Black Panther presents a glimpse of a thriving black community which should not be overlooked. Black Panther depicts a black king, along with other members of his royal family. Their exploits resemble those of real African kings and queens. We have heard of kings and queens of Africa, yet many of us know little about their accomplishments. The lead character in Black Panther is T’Challa, the new king of Wakanda. All you need to do is research kings like Mansa Musa, Akhenaton, Imhotep and you will see the obvious parallels between them and Black Panther’s T’Challa. T”Challa’s mother Romonda is the Queen of Wakanda. All you need to do is research queens Hatshepsut, Makeda “The Queen of Sheba”, and Ann Nzinga “Queen of Ndongo” and you will see obvious parallels between them and Black Panther’s Queen Romanda. In this regard, the movie Black Panther serves as a connector to former kings and queens in Africa. Black Panther will instill a sense of pride and accomplishment in many black men, women and children. Let’s face it: we need to see more images of positive black people who are doing great things. Even though this is just a movie, it sure feels good to see this character on the big screen. It sure feels good to get positive images of “Africa” on the big screen. It sure feels good to know we can be heroes too. It sure feels good to finally be included in this genre of films. The thought of Black Panther just feels good. The movie Black Panther is a trailblazer that was long overdue. The use of a black superhero in a leading role of a major movie franchise is a remarkable achievement. For me, it is a game-changer. It is another black “first” that needs to be celebrated. I suggest you celebrate by going to see this film, and/or buying it on video. Based on most reviews, it is an outstanding picture. By the way, it will not be long before we see the second installment of Black Panther so enjoy the ride. You are witnessing a trailblazer. The Kingdom of Wakanda awaits! This entry was posted in Uncategorized and tagged Avengers, Black America, Black History Month, Black Lives Matter, Black Panther, Marvel, Wakanda on February 17, 2018 by motivationfortheworld. What Would Have Been Your Reaction to Racism? Which Person Are You? Recently there was a primary to select candidates who will run for the office of mayor of St. Petersburg, Florida. During the campaign, the candidates had the opportunity to participate in a forum. There were six candidates at the forum. The rules for the forum were strict, and guidelines included how candidates could respond. One candidate was asked a question, and then the next two candidates had the opportunity to respond. After this, a new question would be presented and the next candidate would start the question and answer process again. In this way, the moderator could keep order during the forum and all candidates could get equal time to speak (remember this key point). Answer: “My commitment is to reparations to the community, to the black community that has suffered these damages under these current administrations,” …answered, adding that “no amount of playground or recreation centers could “heal the wounds” of victims’ families of died at the hands of law enforcement officers”. After this exchange, the candidate who offered the answer could not respond because it was no longer his turn. Shortly thereafter, one candidate broke the rules of the forum to address the response he heard. He offered a harsh rebuke to the tone and substance of the response. Another candidate wanted to rebuke the response, but chose not to draw more attention to the response. (Instead, he offered his response and rebuke the next day). Other candidates chose not to comment on the response. Are you Person A: someone who would have offered a response to racism if given an opportunity? Are you Person B: someone who makes racist comments or fans the flames of racism? Are you Person C: someone who hears about racism, and speaks out against it regardless of the circumstances? Are you Person D: someone who wants to speak out against racism, but does not know the time or place or how to do so when a racist comment or incident occurs? Are you Person(s) E: someone who chooses not to respond to racism at all for unknown reasons? Before you answer, think about each person and SOME POTENTIAL reasons for their behavior. Person A was “silenced” so his voice and opinion may “never” be heard. He represents those who do not have a voice or platform to speak out. Person B used the forum as an opportunity to publicly use racist language without concern for who it might offend. He represents those who want to fan the flames of racism for unknown reasons. Person C used the forum to respond and “fight” against racism. He represents those who speak out against racism as soon as they recognize it. Person D did respond, but after thought and consideration led him to speak out later. He represents those who know racism is wrong, but may not be comfortable with responding to racism or the method to do so. Person(s) E turned a blind eye to racist language and remarks. They represent those who choose not to respond, possibly because it does not affect or offend them personally. 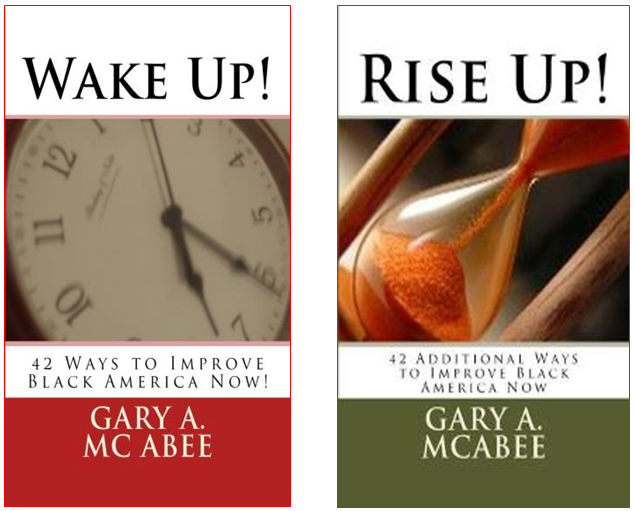 Gary McAbee is an educator, author and motivational speaker. He has written three books: Wake Up!, Rise Up!, and Defining Success: One Word at a Time. This entry was posted in Uncategorized and tagged Anthem Proests, Black Lives Matter, Colin Kaepernick, Police Brutality, Politics, Racism on October 7, 2017 by motivationfortheworld. An important idea that African Americans can use is the concept of making claims. Making a claim is another way of saying making a declaration about something. The degree to which we believe in the claims we make is the conviction that we have when we actually make the claim. It is also all about faith. More faith means that we can make more powerful claims. More powerful claims are destined to become reality if we believe that they will come true. There are different types of claims we can make and different expectations that African Americans can have for each claim. The first type of claim is what we can speak into existence. When we speak it, it becomes ingrained in our thoughts and daily routines. The claim becomes a call-to-action. The call-to-action puts us to work on what we have spoken. It is just a matter of time before the work we put in will produce the results we want. If you want more peace in your life, speak it into existence. Your actions will lead you to find peace. If you want more money, speak prosperity into existence. Your actions will lead to greater wealth. If you want love in your life, speak it into existence. Your actions will lead you to find a suitable mate. We must be aware that the claim must be supported by effort or it will not come to pass. Faith without works is dead. Another method of claiming is to know your best friend: you. Based on what you know about yourself, you can figure out how to make the right claims based on your talents and abilities. The idea is to use your talents and put them toward a goal that is attainable. Many people shoot for the moon with a slingshot, then question why their expectations do not come true. Instead, we should learn how to match our skill sets with our desires and claim what we want based on accurate conclusions. What is your claim to fame based on what you know about yourself? Do you handle crisis situations well? Your claim to fame could be helping others. Maybe it is the care and concern you show for others. Do you handle your business effectively? Your claim to fame could be running your own business. If you know your strengths and weaknesses, you can make your claims based on your potential to be successful. An example of the concept of making your claim to fame is finding your passion. Another way to look at passion is identifying what you are good at doing. Is there anything that you wouldn’t mind doing for free as long as you do not need it for financial support? Your passion is something that you do that makes you feel alive and at your best. It does not have to be work-related or tied to a specific job. Passion makes us commit all of our energy to what we want to accomplish. After African Americans identify their passion, we must claim it. Let the world know your talents and abilities. This is the reason why we are given our talents. It does no good if an African-American woman or man is blessed with unique abilities, but does not live up to their potential. As a race, we all suffer every time this occurs. We must build upon our talents to make a difference in our communities. It all starts with making a claim. Those who do not excel when they know their passion are usually good at claiming failure instead of success. How many African Americans do you know who choose defeat before getting started? It is surprising how many people accept failure before making an attempt. Also, if they speak failure into existence, failure will be sure to arrive. The concept of claiming your fame works both ways. The enemy of making a positive claim is fear. When fear is present, it prevents people from seeing positive outcomes. Instead, we close the door to success. There is a familiar story of a man who worked at the US patent office in the 1800s. He was confident that everything could possibly be created was already invented. He made a claim that humans could not invent any more things, so he quit working in the office. This man’s claim to fame was underestimating the power of human creativity, ingenuity, and imagination. His claim to fame is also having his story used as an example 150 years later! The example leads us to an important part of the process. If we make the correct claim to fame and make it come to pass, we will be remembered for our accomplishments. The highest achievers in our race made their claim to fame. Benjamin Banneker’s claim to fame was mathematics and astronomy. Lorraine Hansberry’s claim to fame was writing plays and essays. Matthew Henson’s claim to fame was exploration. Madame CJ Walker’s claim to fame was invention. Imagine what would have happened if these great African Americans would not have claimed their fame? What if they did not speak about their vision and goals until they became reality? Suppose they did not find their passion and pursue it until they realized their dreams. These people, along with countless other African Americans, claimed their fame. As a result, our race is better off because of their successes. Our world has reaped the benefits their achievements. Just like we will be remembered for our achievements, we will also be remembered for our shortcomings if we do not live up to our potential. So once again, we end up back at the same starting point. Claim your fame and work to make it a reality. Claim positive results and positive results will come to pass. Find your passion and make it the driving force behind your success. This entry was posted in Uncategorized and tagged African-American, Author, Black Lives Matter, Faith, Gary McAbee, Motivation, Motivation for the World on April 11, 2017 by motivationfortheworld.